Open Gyms provide an opportunity for students and the general public to train safely within our facility and utilize our equipment. 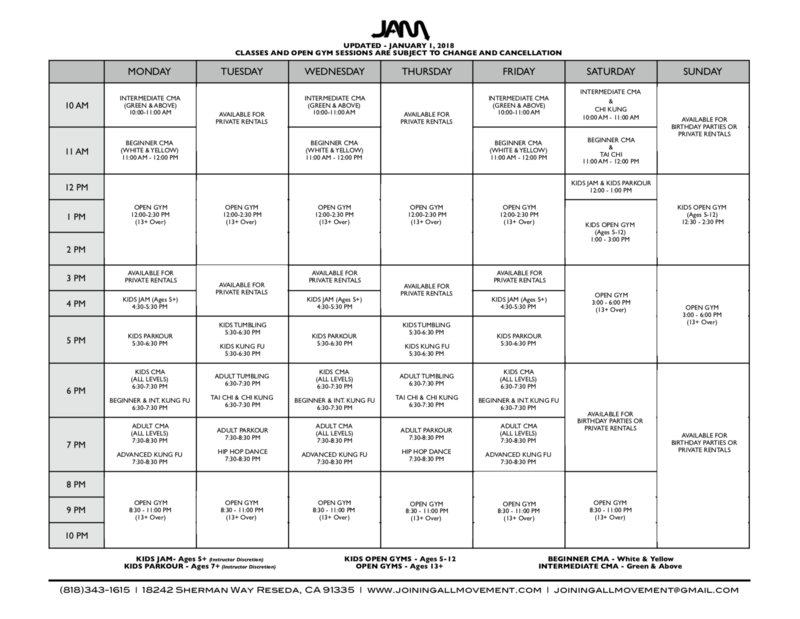 Open Gyms are offered 7 days a week. Students will be introduced to elements of hip hop dance, through learning basic dance concepts/movements as well as learning choreography. 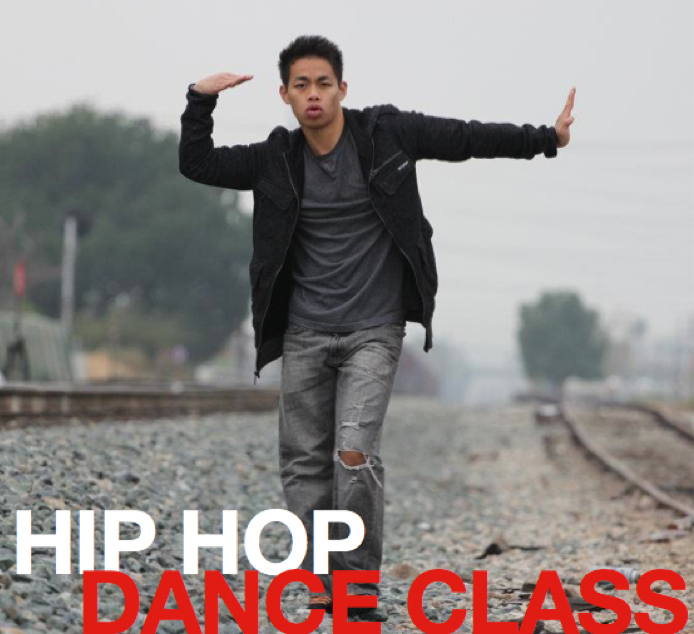 Students will learn elements of hip hop including: Locking, Popping, Grooving, Breaking, Tutting, and many more. 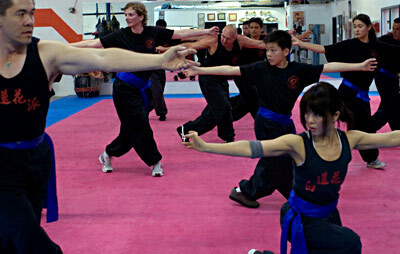 We offer begining and advanced classes in Kung Fu. Instruction is personalized, and grounded in the White Lotus System. Our instructors are among the most respected in the field and bring a genuine love for this amazing art to each class. 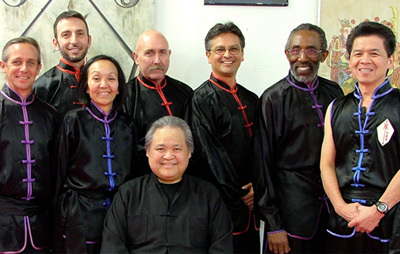 Tai Chi Chuan is recognized by the Arthritis Foundation and the AMA. Students will learn a wide variety of kicks, flips, tricks, and transitions that are part of this young and growing discipline. 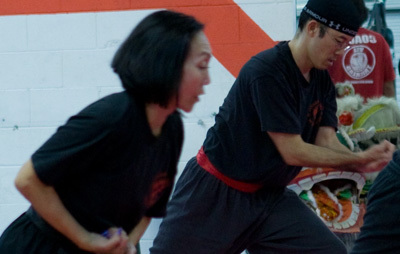 Tricking utilizes martial arts techniques and kicks combined with off-axis flips, twists, and variations that make it unique. 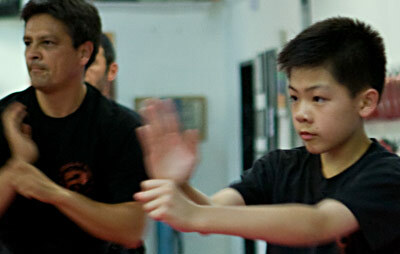 It draws upon elements of Capoeria, Tae Kwon Do, Karate, Wushu, Gymnastics, & Breakdancing. 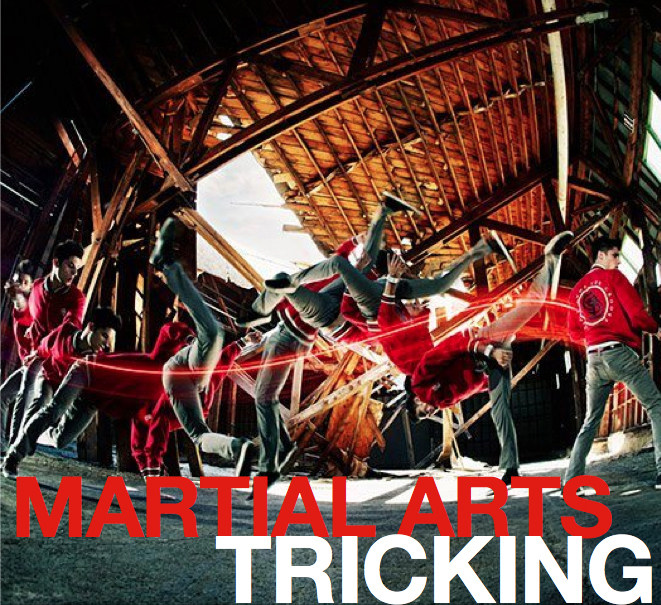 Tricking involves trying to perform difficult or aesthetically pleasing combinations of moves. 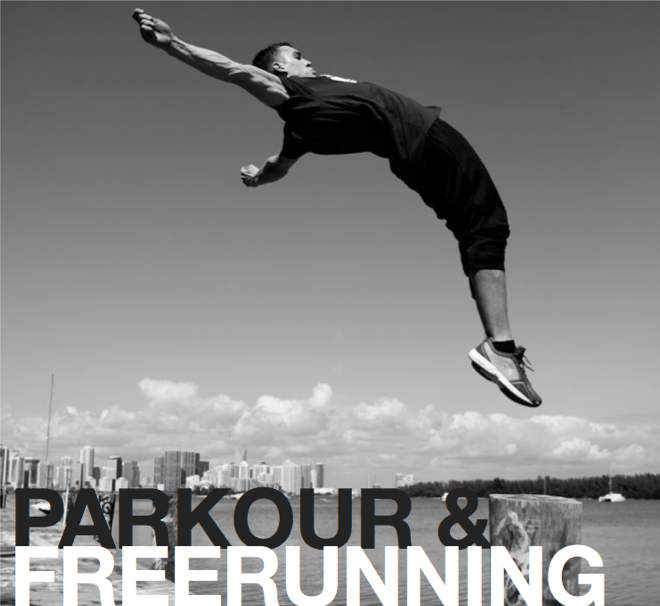 Students will learn the fundamental principles of parkour, and progress from beginning to advanced freerunning techniques and moves. 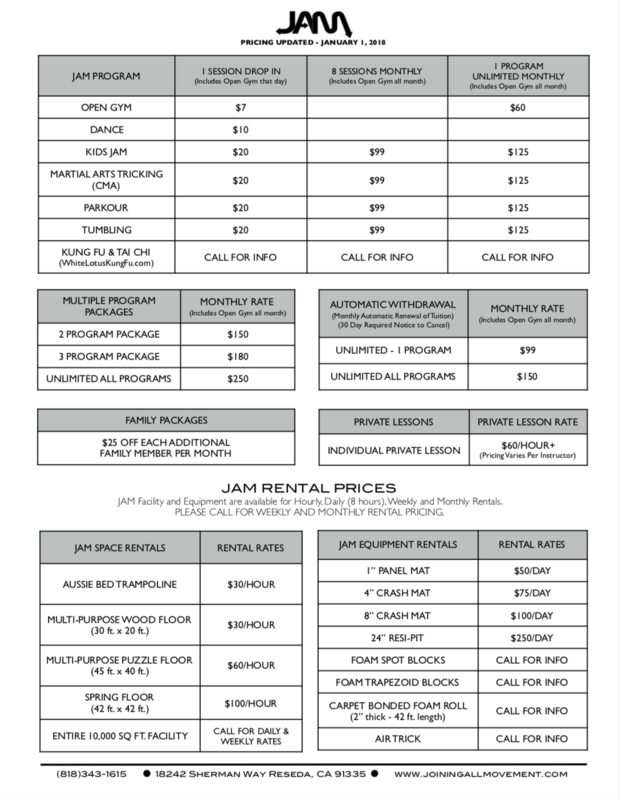 From vaulting to precision jumps, striding to ascending and descending, students will utilize all areas of the JAM facility and equipment including the dedicated parkour section to safely and efficiently learn this constantly evolving discipline. • Can roll a frying pan! Students will be instructed in traditional tumbling techniques and acrobatics. They will begin with basic gymnastic concepts and fundamentals, and will work their way up to more difficult tumbling moves and combinations. Front & Back Handspring, Front & Back Flip, Aerial, Full Twist Variations, Combinations of Tumbling Elements, and utilization of the Trampoline and foam pit to help further each students’ progress.